Your age pension concierge service for Centrelink. Case studies and observations on claiming and maintaining the Centrelink age pension in Australia. The objective of this blog is to inform and promote discussion. Information contained within is generic and does not constitute advice, and professional assistance is recommended before any action taken with Centrelink. Australia’s social security policy and service delivery system is not designed to put customer needs first. Since its creation in 1997, Centrelink has always had to deal with a troubled public perception of the quality of its service delivery. Challenges of long queues in crowded impersonal offices, and incomprehensible form letters, are well-known. Even before the robo-debt crisis (which started this financial year), Centrelink’s wait times have been on a pretty much consistent upward trajectory since the early 2000s. It would appear – contrary to expectations – that with the growth of new technology, problems have got worse, not better, as can be seen in the graphic below. 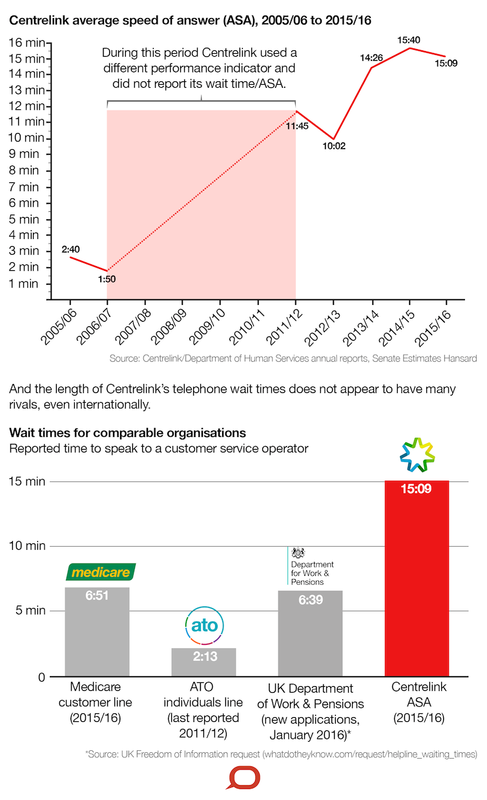 See our full infographic on Centrelink waiting times here. Ten years ago, the Centrelink officer that was dealing with you would almost certainly have been a permanent officer (97% of all staff), and therefore well-versed in the policies. Today, the numbers of casual staff have significantly grown: they now make up 14% of Department of Human Services staff, many of whom seem to be Centrelink call centre workers. 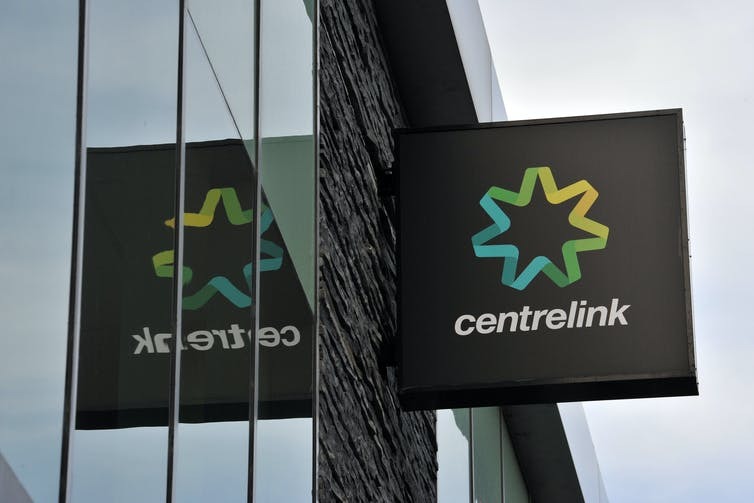 So, it is unsurprising that staff may not be well-trained in policy or how to deal with stressful customer situations, and face pressure to shift people online, ignoring the very difficult circumstances Centrelink customers may be in. Centrelink’s reputation has taken a beating in the last decade. Complaints have more than doubled from around 53,000 in 2007 to almost 114,000 in 2015-16, the bulk of the increase being in the last two years. The top three complaints relate to telephone, internet and processing wait times. Only half of all customers have satisfactory perceptions of Centrelink. So when we are told Centrelink needs to release personal information to ensure public confidence in it is not undermined, the horse has already bolted. It is also troubling that more than 20% of customers do not think they get accurate or consistent information from Centrelink, or that their individual circumstances are taken into account when communicating with it. However, on the positive side, customers believe they are treated with respect by Centrelink officers (though this is down from 96% in 2007 to 90%), and the queues in Centrelink offices have declined from almost 17 minutes in 2013-14 to just under 11 minutes last year. So what could Centrelink do to improve its service delivery and perilous reputation? Annual reports show that there has been a long-term cut in the Department of Human Services’ financial resourcing in real terms. This has been driven by the government’s blunt instrument of efficiency dividends. So, with fewer staff, fewer phone calls can be answered. There have also been continual changes in policy, which has resulted in complexity and uncertainty. With each policy change and associated benefit payment change, customers contact Centrelink in droves to understand the changes and ensure they are doing the right thing to maintain their often-precarious financial state. There has been a continual cultural demeaning of Centrelink customers by influential politicians, which reinforces a view that they do not deserve good service. When Centrelink customers are perceived as leaners or bludgers that do not contribute to society and have a lot of free time, why should we care if they have to wait on the phone for long periods? As a result, Australia’s social security policy and service delivery system is not designed to put customer needs first. To improve its service delivery standards, Centrelink could immediately introduce a call-back feature so customers can request a call back when the queue is long. This is done is many businesses, and also by the ATO. It would be particularly welcome for people who only have mobile phones or who have to call during work breaks. Centrelink could make its online and letter communication easier to understand and less threatening, and provide an accurate and complete explanation for the basis of its decision-making. Centrelink could make better use of its social media platforms to engage with and respond to customers. It could provide dedicated hotlines for particular short-term issues. And the government should also ensure Centrelink is properly resourced to provide good service delivery. Finally, the politically constructed public perception of Centrelink customers as bludgers, leaners and fraudsters must end. Many customers are working as well as receiving welfare, or have had a lifetime of work (age pensioners), or are saving government money by caring for people with disabilities or young children. Those who face the considerable disadvantages of mental illness or poor education can find it very challenging to engage with bureaucratic processes while feeling under threat that the fine thread between survival and destitution could be cut at any wrong move. Now this is a significantly different to that reported by Centrelink staff and that which has been presented at Senate enquiries. The Australian National Audit Office reported that in 2013-14 13.7 million callers hung up after waiting for as much as 1 hour. From all reports the current situation is now far worse; especially since the average age pension claim processing times have gone from an average 6 weeks to 4-5 months! Now let’s test those ‘access’ times. It’s unlikely to be statistically significant, but it may give an idea of how a ‘typical’ Centerlink recipient needs to handle the situation. We are going to work with an age pensioner and log their attempts to contact Centrelink over a week period. We will attempt to contact Centrelink via the phone and then attend a Centrelink office. Let’s consider an age pensioner who is working and needs to report wages. They get 30min for lunch so we will attempt to contact Centrelink during that break and if no answer then we will hang up after 30 minutes. Note: the age pensioner is lucky enough to have a mobile phone – but not a smart phone - and to save costs cancelled their fixed line some time ago. Hence a 30-minute call to Centrelink’s ‘Older Australians’ 13 23 00 number will cost approx. $30. Also for this trial we will visit a Centrelink office after that midday call. Now in practice this would also need to be done during a lunch time as Centrelink offices are only open between 8:30 am to 4:30 pm and the age pensioner works during these hours. It is likely that the lunch time queues would be longer than what we will experience; but it’s enough for this ‘trial’. Again the pensioner will wait 30 minutes – in practice they would have less than 30 minutes as travel time would need to be allowed for. Call: commenced at 12:03 – No answer, hung up at 12:37. Visit: visited Centrelink at 3:42pm and told there are too many in the queue to be ‘serviced’ today, so “please come back tomorrow”. Call: commenced at 12:07 – No answer, hung up at 12:31. Visit: visited Centrelink at 1:16pm, registered at the kiosk, and waited…After 30 minutes left without being served. Call: tried 4 times to connect and eventually connected at 12:13 – hung up after 30 minutes wait. Visit: was told at Centrelink kiosk that there was a 2hr wait, so left. Let's hope next week is better. Call: tried 8 times, connected at 12:20 - hung up after 40 minutes. Visit: minimum staff - "holiday and sick" - "can't be seen within the hours". Left. Tomorrow will start work late and go to a Centrelink office first things @ 8:30am. Visit: Success! Only waited 20 minutes and was able to submit income earnings for the previous fortnight. 1. The process of reporting to Centrelink is cumbersome and time consuming. The above process could be repeated each and every fortnight. 2. It is clear that Centrelink are pushing clients towards on-line systems. However, even the Governments own IT advisory body (DTO) does not recommend its use. The apps and web services are not compatible with all platforms and cause confusion with respect to what information Centrelink can request and retain. 3. It is also clear that it is in Centrelinks interest - or it certainly appears that way - that barriers are built for the efficient reporting of circumstances. Claims are delayed or rejected, debt notices are issued for non-reporting etc. all assisting Centrelinks bottom line. 4. More and more people are 'moving' to use 3rd party organisations - such as yourpension.com.au - to avoid problems, reducing the chance of debt notices and 'get on with life'. However, Centrelink do not provide IT support for nominees; "its coming" Centrelink have been saying for more than 10 years. Centrelinks suggestion? "Just log on as the client". This not only conflicts the nominee agreement but it is an offence! Note: Now we have attempted to replicate a typical attempt to contact Centrelink. Of course it is possible that some recipients have the opportunity to contact Centrelink more than once per day. However, as can be demonstrated in the above, unless that person has more than 30 minutes break then it is nigh impossible. By now most pensioners will have received a letter from Centrelink outlining the changes to the age pension test from 1 January 2017. We have received a significant number of queries regarding this letter. Hence, we will attempt to summarise the most common concerns. For expediency we will use one central reference ‘document’ that in turn refers to key Government data. This reference is one of a series of fact checks published by The Conversation. We will refer to this document as The Conversation. Proportion of pensioners affected – 90% unaffected sounds better than 300,000 Australians to lose. The Centrelink letter states that “Ninety per cent of pensioners will either not be affected by this change or will receive an increase in their pension”. The Conversation estimates that 2.4 million Australians “were receiving Age Pensions or Veterans Affairs Pensions”. Therefore, Centrelink are saying that approximately 240,000 Australians will have their pensions rejected or reduced. 1. All too often older Australians would prefer to continue to work but are constrained due to Government policies such as work cover insurance schemes ceasing before the age pension entitlement date, or simply there is no work for older Australians. 2. Most age pension claimants were contributing 3% of their tax to the age pension for the majority of their working life. Some still have their pay slips with that compulsory Government deduction. 3. The age pension is not the largest ‘welfare’ budget item. While the ‘dole’ is approx. 16% and child assistance schemes account for more than 40%. The Conversation states that “As we know from the Intergenerational Report, the proportion of Australians over 65 years is forecast to increase, leading to upward pressure on welfare spending. However, the overall number of Australians who rely on government benefits as their main source of income has been going down from about 28% in the mid-1990s to just under 25% in 2011-12.” Additionally, we know that the proportion of age pensioners in proportion to the tax paying population continues to fall and that trend is forecast to continue. 4. It’s funny that when we consider the kafuffle about the proposed tax concessions for the recent superannuation changes, where a $1.6m limit for an individual was proposed. Compare this to the approx. 25% of that level is applied to a couple’s asset limit before reductions in the age pension are enforced. The Centrelink letter provides tables on the asset threshold changes and it can easily be interpreted that the changes only impact on those age pensioners whose part pension is being determined by their asset levels. This is not always the case. It is possible that your current part pension is being determined by your income yet the changes could result in your age pension now being determined by your asset levels. “where you can access an asset tested rate estimator”. Be careful of the wording “If you are age pension age or over on 1 January 2017 you will also be eligible for a Commonwealth Seniors Health Card.” And for the Low Income Health Care Card be “automatically be eligible”. This implies that you will not automatically be posted the cards. Many have interpreted the Ministers statement as age pensioners will automatically receive a card for use before 1/1/2017. We will assume the Ministers statement is correct and you will automatically be issued with the card. We will further assume that the Medicare/Health benefits will automatically be linked as you will continue to have the same CRN/CAN Centrelink client number. However, for most age pensioners the benefits are primarily with State and Local Govt based fees such rates, car registration, utilities etc. We are recommending that you contact these organisations to ensure the discounts continue after 1 January 2017. The Commonwealth Seniors Health (CSHC) card is an income based card only and does not consider assets. The changes to the age pension relate to assets. Hence if you are ‘on’ the age pension you would already be automatically entitled to the CSHC. The concession by the Government appears redundant. If the Centrelink letter is accurate and current processing times for the age pension are 4+ months! We expect a deluge of age pensioners applying for the above cards causing significant processing delays. Be warned about the possibility of loss of benefits during the processing times. We have been unable to determine what the implications are for ‘grandfathered’ age pensioners. Grandfathering only applies until ‘circumstances change’. Is this change by the Government being interpreted as a changed circumstance? We are also intrigued by the statement regarding the Low Income Health Care Card (LIHC) and CSHC cards that “they will never be income tested so you will retain entitlement to the cards indefinitely provided you continue to meet all other eligibility requirements.” With the CSHC card it is an income based card and has no assets test. So currently you could have $20m in assets – excluding the family home - and receive the CSHC card. The Centrelink letter implies that you can go back to work and receive $200k pa and still get the card - really? If you are interested in where the age pension is heading, we recommend the Governments National Commission of Audit report. Where the report continues the trend of converting the age pension from a pension entitlement to a welfare payment. Where, for example the report forecasts that the number of ‘part’ age pensioners will increase and ‘full’ pensions will fall. A house in Bali and a full age pension. “John” recently “went through” a divorce and considers that he no longer has the funds to purchase a home whilst on the age pension. John is living with his son and their family. John and his former partner were on the full age pension and both were receiving approx. $660 pf. This is a summary what he did following the sale of the family home. He continues to run a small business that requires him to travel to Bali to purchase stock. He determines that the company would benefit if he “bought” a house in Bali to use when he visits. You can not own property in Bali but it will be treated as an investment property for Centrelink purposes. The property is valued at $300k. John also has a further $200k in super. As a single age pensioner, without assets, he would have been entitled to approx. $870pf. Now with the above assets his age pension falls to nearly the same as what he was receiving as a part of a ‘couple’ to $660pf. John's age pension now rises back to the full single age pension rate – from $660 to $870pf. Is $0.5m in super really a “small amount”? When providing advice to a Centrelink age pensioner, a recent article in the mainstream press (7/9/16) suggested “for a relatively small amount, such as $500,000”. Of course “relative” can mean a number of things and is dependent upon - relative to what. So let’s look at that relativity. First we look at what $500k in super means to a single age pensioner – as was the case for the press article. Let’s assume that this was the total amount of assets held by the age pensioner. The age pension would be reduced from $870 to approx. $440pf for that “relatively” small amount. In 2017 that age pension is expected to be reduced by a further $7,700 pa. A weekly loss to the age pensioners 'budget' of nearly $150 per week from the current 2016 pension. Back to judging whether that $500k is a relatively small amount. So we will pick out a stat to assist with judging that relativity. The data relates to “average superannuation balances at the time of retirement (assumed to be between 60 to 64 years of age) in 2013/2014”. That is, for men, 50% of the retiring population has a superannuation balance of less than $100,000. For those applying for the age pension it is presumably far lower. Therefore, the above mentioned relatively small $500,000 is at least 5 times that of the median for all retiring males and nearly 20 times that for women! Update 8/8/16 – since we published this article we have received a number of comments regarding the above statistics. So we should expand in an attempt to explain. Much of the difference between median and average is attributed to the number of people with large super balances and those without any super. (c) Symbotic Pty Ltd. Simple theme. Powered by Blogger.